A lot of Americans hear about our High Budget Deficit and how it will erode our economy and everything we hold dear. However, few know the antidote that an individual can own to help protect themselves from the rising deficit and its eroding effects on our lives. First, one of the biggest misinterpretations that I find that people make is that they mix the terms deficits and debt together. So what are Deficits and Debt? 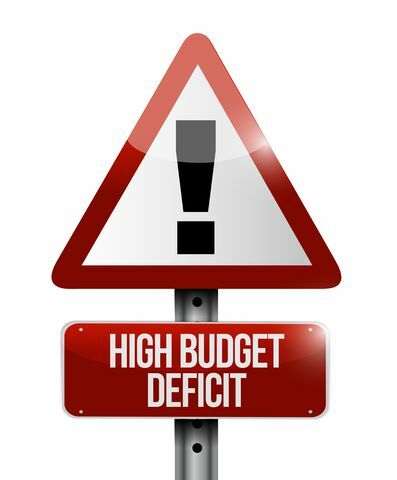 A deficit happens when an entity or government spends more than it earns - in a particular period, and Debt is the total sum of the accumulated deficits. Why is the Deficit Going to Get Bigger? For the last year or two, I've posted on the homepage, news articles from a blog called 'Econimica' (the blog was originally named 'Hambones Stuff'). I have no affiliation with the site, nor did I contact the author of the site prior to this post; I am simply pointing it out to you because the author has been writing (repeatedly) about critical subjects that go to the heart of a rising deficit question. The subjects being; the Aging Population and Population growth or lack thereof, and how it will ultimately affect the U.S. and Global economy and our lives, with higher deficits and debt. Over-spending is what causes deficits and debt, but if you don't have a productive economy with more young workers than old, you won't be able to combat the problem, and it will continually get worse. In 1968, the Doors produced a song title "5 to 1." The title of the song was based on the ratio that there were 5 youths to 1 older individual. Today, that ratio sits around 2 to 1, and within a generation, the ratio will be closer to 1 to 1. The author of Econimica doesn't always point out to you that our failing population demographics will lead to higher deficits, but it's right there staring you in the face, as you read it. It would be a disservice to you if I wrote at length about these issues because of the time and effort that this author has taken to put these articles together to help you learn the about these problems that we face. Econimica - US Popualtion Growth & Fed Funds Rates Correlated...Until Now!?! If you want to understand this issue, I would suggest that you may want visit Econimica, because it covers the demographics issue better than any other site I've found. Furthermore, this chart by Bloomberg tweeted yesterday, provides you a snippet of the information that you'll find at Econimica. The problem isn't going to get better anytime soon, Gold and other precious metals are one of the few antidotes that will help the individual when this problem really starts to get outta control. Last week gold didn't do much, it mostly traded sideways and consolidated after it had taken the fall in the prior week. The chart below is from the October 2nd's blog post; it shows a 'New' Ascending channel. The question mark ('?') is beside 'Ascending Channel' because I was using a different ascending channel but recognized this one and it looked a lot like the one in silver's chart, so I wanted to show it to you. 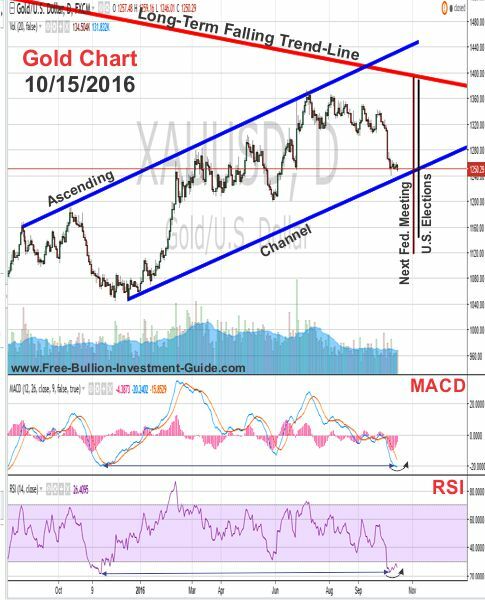 But, current trends aren't looking good for gold to stay inside this new ascending channel, I explain why below. In the first week of October, silver broke below the Ascending Channel I had drawn in its price chart, seen in last week's post - here, and as you may or may not know on a daily basis Gold and Silver trade relatively the same, but in the long-run, silver leads gold. 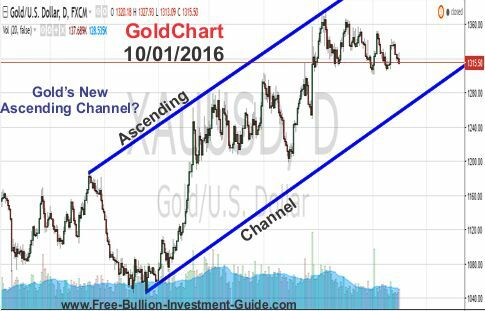 So will Gold break below this New Ascending Channel? In the introduction of this blog post, you've probably gathered that gold's long-term perspectives are looking pretty good. However, in the short term, I don't know if it is going to stay inside this New Ascending Channel, time will tell. In the immediate future, gold's MACD and RSI are treading in oversold territory, the last time we saw gold this low in the MACD and RSI was in January when it hit multi-year lows, so we should see them both rise next week along with gold's price. Furthermore, the red and black horizontal lines on the right-side of the gold price chart, above, I have indicated when the next Fed Meeting happens on Nov.2nd and the U.S. Elections on Nov. 8th. I also show these indicators in the charts below because they will have an impact on gold, silver, and the U.S. Dollar. In last week's post, seen here, I posted this chart where silver broke under its ascending channel. 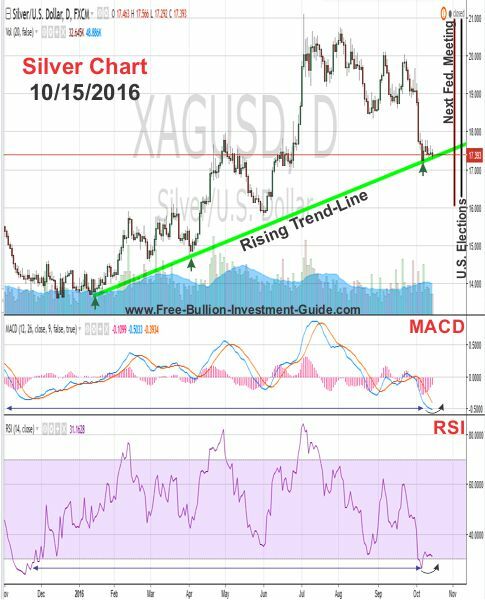 This week, I found a new rising trend-line that still works on silver's chart. A Trend-line is a visual representation where two or more points connect to make a line, in any time frame. On the chart below, I show you where the support levels are for this new rising trend-line. 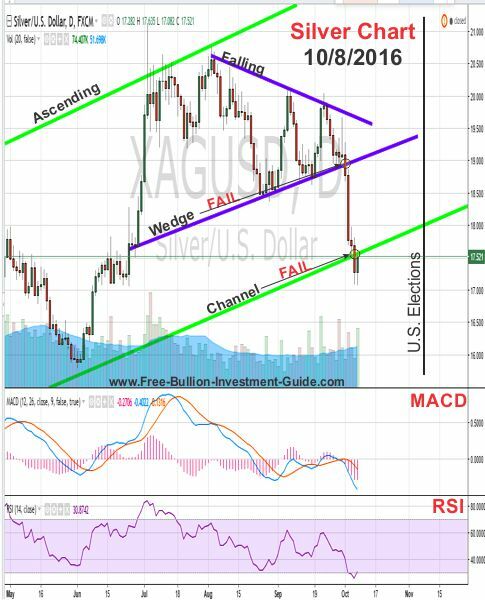 I drew this line after I erased the lines in the Oct 9th post, and to my surprise, silver traced above the line which could be a positive sign for silver, but only time will tell. Also, like gold, silver's MACD and RSI are bottoming. Silver's RSI hasn't been this low since January, and its MACD hasn't been at this level since before its multi-year low in January, so we should see some reversal this week. 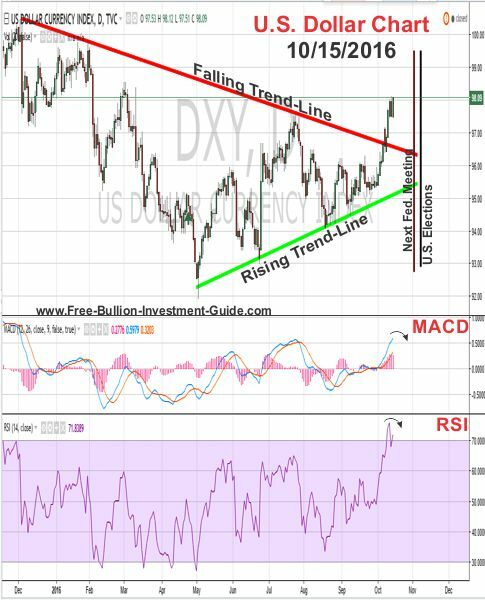 Last week the U.S. Dollar broke above the falling trend-line indicated in the chart below. However, it broke it on a down day, which didn't make a whole lot of sense, but I stated that I would leave both trend-lines on this week's chart to see what happened. Well, as you can see in the U.S. Dollar chart below the dollar's price kept moving above the falling trend-line and it is currently sitting just below the $98.25 resistance level. This is a positive for the U.S. Dollar, however, the dollar's MACD and RSI are both topping out in over bought territory, so next week looks like it will be a down week for the dollar. Lastly, in regards to the U.S. Dollar's support, there are currently only two things, to keep in mind, that is keeping it up in price. The First one is the Federal Reserve and its constant warning to the Market that it will raise rates. They do this because, if they don't, the markets will lose confidence in them and the economy. The second is that among the world's currencies the U.S. Dollar is currently the best looking turd among them all, and market traders run to it as a safe haven before other assets because they're actions are dictated by the Federal Reserve.